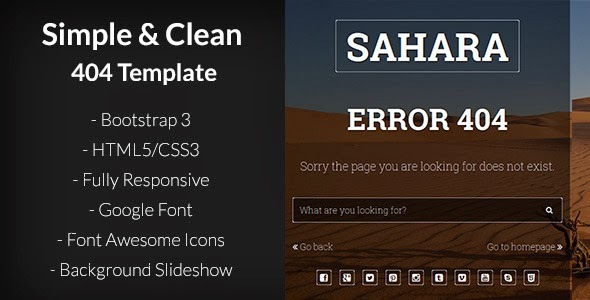 Sahara is a simple & clean 404 responsive page template. There is a two versions of template, simple background image & slideshow background. Also template using css3 animations, have search form, social icons, accordions for information. The template have full documentation and comes with additional PSD, PNG files. Item Reviewed: Simple and Clean Responsive 404 Template 9 out of 10 based on 10 ratings. 9 user reviews.